Halloween's over and done with. It's time to kick the rotting pumpkins to the curb. Twitter handles go back to normal. 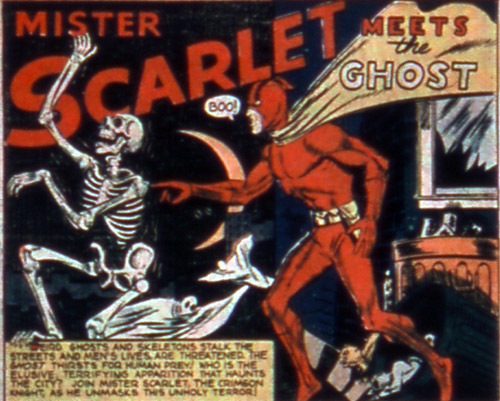 And for superheroes like Mister Scarlet to put the monsters back in their place. Who? Yeah, for a guy with some 50 appearances in the Golden Age, who has THREE STRIPS in this very book, who was originally based in "Gotham City" (but not THAT Gotham City), who was co-created by Jack Kirby (what?! I didn't know that! ), back to back, and who DID feature in the Crisis on Earth-S JLA/JSA story, he really got ripped off the day Roy Thomas submitted heroes for Who's Who! Roy was probably too embarrassed by the fact that he'd have to include the side-kick named "Pinky."